The bar that contains your tags, categories and post info is now more subtle, and has swapped positions with the comment count, bringing the attention to your brilliant content. Your subtitle appears in a cute little word bubble in the upper right, and the header font has been freshened up as a sans serif. Print geeks, enjoy. And don’t forget you’ll need to look under “T” for “The” under Design > Themes in your dashboard. I loved the way the comments were handled before the changes. The speech bubble takes a serious-looking theme and makes it appear kind of childish in my opinion. Whoa! Thank you, those are indeed big improvements. Good to see the annoying, frankly oversized tag and category box has been moved to the bottom of the post – it actually looks pretty good now. Congrats. I like it, but I’m not sure I like it quite as much as the previous one. You see, I liked the horizontal black bars between each post. It’s lighter now, but it’s linier. I do like the speech bubble though. And I really like the sans serif font and the increased leading between paragraphs. So it’s obviously growing on me even as I type! Heather, I love that look in your eyes! I’ve been using the Journalist since starting my blog in May and have been very happy with it until now. One problem I’ve encountered is the subtitle bubble isn’t long enough for my subtitle. It looks like I may need to edit the text. Otherwise, it’s a huge improvement. 1. The black bar dividing the posts has gone. Now one post almost merges into another. 3. I preferred the old style font anyway, It looked more … journalistic. 4. It won’t accept H1 headings next to photos, which has thrown out a lot of older posts. I don’t like it but changing to another template is going to be a real problem due to width limitations on photos. I’d either have to adjust all my old posts (an enormous task) or delete them if I changed to another layout. There are some improvements but overall (for me) it’s ruined the look of my blog. Amazing changes were made, I love it very much. Keep it up please. I have this theme in my blog and I really loved those changes. Very good work, congrats for it. In addition to my earlier comment I found the main column resized a little, which meant I had to edit some pictures. Oh, man. I suppose there is nothing I can do if I liked the way it was before. Anyway, Lucian, thanks for a beautiful theme. I have loved using it. My blog is completely messed up. Why not call the theme a new name and let us keep the old one? i really loved that journalist before. i have a fashion blog and it was perfect for the oversized pictures. this one still handles them but has a blue outline to show when it’s linked. i really don’t like that. i hope that the old one will be added as another option in addition to this new one. i REALLY don’t like the new one at all. Wait a minute… if one is using the old The Journalist and has no use for the new one (much too casual looking; we prefer serifs and the text bubble is hideous), will the new version be imposed against our will? Awesome! WP is the best! It doesn’t beat the Pressrow theme which combines blogging with journalism pretty well! Yes, i am fall and fall in love, when see your avatar. This is probably my favorite WordPress theme right now. I don’t like that you guys changed the width of the columns. I was using this as the theme for my photoblog and all of a sudden my photos no longer fit in the confines of the post’s column. Otherwise I had loved this theme and like the changes, but because it no longer fit my photo size, I had to switch to something more “blah” but with a variable width. I like it – I think. But, you scared the Bejeebus out of me when I just logged in. I figured I must have done something stupid to the formatting of the Post I had scheduled to appear while I was away doing silly thing like having supper with my wife, us going for a walk with the dogs, watching James Richardson’s Football Matters on Setanta Sports Channel. I wandered back into the study to sort posts for the rest of the night and into tomorrow morning – logged into my site, quickly switched to another browser and logged in, again – before I finally noticed my theme is now Journalist, Revised. Thinking about it a bit more, I do still much prefer the theme after the changes, but I have mixed feelings about the word bubble with my blog’s tagline. It would be good to have the option not to have the bubble, but leaving my tagline blank doesn’t remove it, merely leaving an ugly small black bubble in the top-right corner instead. Being stuck with using it then, I’ve had to remove my tagline from where I manually typed it into the title of my “pages” widget, directly below my bubble, but that leaves me with the automatically generated “pages” title to that widget which I don’t want either. Sigh. I’ll have to create the links manually in a text widget and use that instead. That’s no big deal, it will only take 10 minutes or so, and I still like the bubble personally, but still, the bubble has a BIG impact on the look of the new theme, so having it as an option would probably be appreciated by many users. Sorry, but it is awful! The blog is centered in the page, grey shadows added that ruin the minimalist design, a silly little balloon added to the top right of the page with the subtitle of the blog, the font is awful and big, and then for some bad reason right under the title of each post without comments it says: WITHOUT COMMENTS as if that were somehow the really significant point about the whole post. I am protesting this, it is a very bad change and should be reverted to what it was before. as quickly as possible. Nice, however, most of my readers have told me they do not like comments at the top of an article…they forget or are too lazy to go back scroll back to the top of the article to comment. Also, I can’t see the point about sticking a grey border around each image. Hey, if it wasn’t broken, don’t fix it. At least offer this new version as a Version 2, rather than eliminating the previous one, which was far classier. Instead of love for the revised theme I feel nausea. Now some of my text overlaps my pictures. New and improved? No thanks.
. . . um, no, i don’t like it! Content in a sans serif font? “With/without comments” distracting from the headers? I hope this “makeover” to the Journalist theme is not seriously-for-real? I really appreciate the WordPress service, but changing a theme without notifying paying users or giving them recourse to change it back is not terribly good customer service. Please provide a means with which to revert to the old theme. I don’t like it either, especially the speech bubble. The previous style was clean and professional, and much nicer! Seriously, this is more than “subtle” change. It’s different. I choose this theme before boz I like exactly the way it was. This revised sound like a favourite, but it’s not. Let us choose what we want. The problem is you’ve substantially altered a template that there is no real alternative to. Switching to another template won’t work due to the unique features of the old ‘The journalist’ so we’re stuck with this new one, which looks inferior. Unless we wipe out all our old content and start again. I am writing from Austria (Vienna). Sorry, but I have big problems with this change. I would prefer the “old” version which was really sophisticated and smart. For me the Theme “The Journalist” is the programm of my blog. I am journalist since 1990. On my blog are actually 218 articles and 360 photos. I write in german language about justice, crime and invstigations. And now I am shocked that I have to edit most of the articles new because the photos (650×450) are to big. Also the second column is down and not at the right side on my screen. WordPress should inform before an new version (0.2) comes out. There should be the possibility to use the old version (0.1) or accept the new one (0.2). To have no chance to choose is a bad surprise – for me. 1. Reinstate the ‘bar’ between posts but make it grey like it appears now when you ‘sticky’ a post. The separation is better that way. 2. Remove the unnecessary blue border to photos. 3. Reduce the size of the caption font. 4. Put ‘comments’ at the bottom of the post and replace the phrase “WITHOUT COMMENTS” to something like “no comments yet”. 5. Oh, and there seems to be a problem with some of the ‘tag’ categories running into the sidebar on some posts. Then I might be able to avoid deleting my entire content and starting up afresh on a different template. I like the previous one better. Can’t you make both versions as two themes, so we can still choose the previous one as our blog theme? I really liked the black bar that divided the posts… Indeed I miss it. The previous version of The Journalist was my absolute favourite theme. Please, let us have the old one back! I like the old one better. Maybe two versions could be a possibility? I don’t use this theme, but I hope you could revise some other ‘outdated’ themes too, like widgetizing Hemingway or updating Freshy to 2.0. BUT: the frames around the images are VERY disturbing, like you can see it in my blog…….. There are people here posting about “how awesome” and “cool” the distortion of the theme is, and when you go to their blogs they are not even using it. My blog is completely messed up too. I want to keep the older one! Just because YOU think it’s an improvement, you can’t redesign other people’s blogs against their will! I want my old Journalist-theme back! The Bubble looks like Kindergarten. The Font – I chose original The Journalist because of the font! And borders around linked images?! Now my blog looks completely stupid. You totally messed it up! Please switch back from this to the the good old days, when “The Journalist” was for grown ups! No, seriously, you are ruining my style. I hate it for the following reasons. (1) I don’t understand why every single images have to be bordered. (2) The comments are always better below the post and the dates above. (3) The bubble on the top can’t even fit my information in it. (4) Red hovering aren’t necessary and they look ugly. (5) Links in blue aren’t necessary as well and that is why I loved the Journalist theme. In simple words, please return to us the original version on it. A new revise can be done and not a major upset like this. I bet many people would agree with me. I’ve just looked at my blog using Internet Explorer at work, and noticed that my sidebar has been pushed to the bottom of the page! I don’t have Firefox or any other browser here, so can somebody please check and let me know if it’s a problem with just IE (it was fine with Firefox on my home computer when I wrote an earlier comment)? Or is it something to do with my work computer’s screen resolution? Either way, if the new changes mean that I can no longer use the theme because of this problem, then obviously I’m not very happy with them any more! I’m sorry, but it was cleaner and better before. 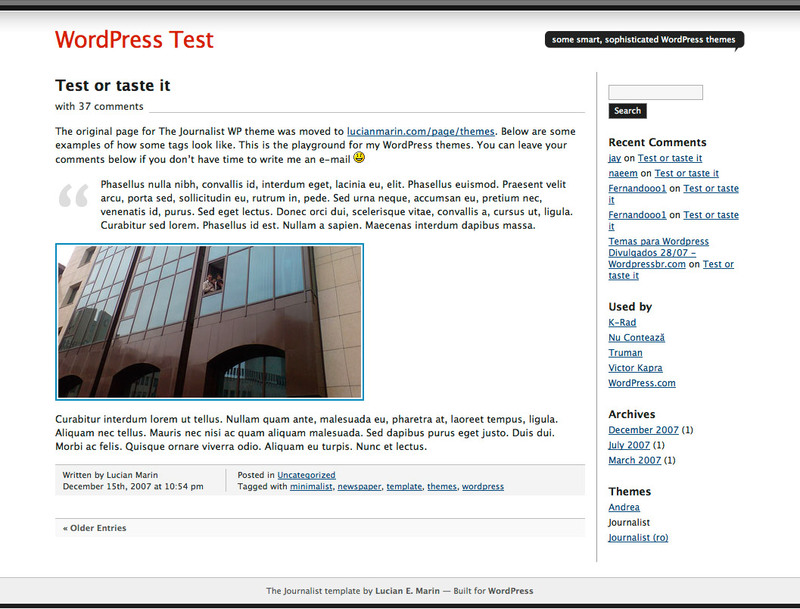 The Journalist WAS one of the few professional looking themes on WordPress.com. As I have a scientific blog bubbles and all the fancy stuff do not really fit my topic – sadly. In addition changing the links color in the sidebar from black to really boring and ugly blue – well – it doesn’t look good in my opinion: The all black look was very professional. However I like that the side information is now underneath the posting: Good idea. All in all it would be nice to be left with a choice: I feel kinda…well belittled…I wanna have a saying in how my blog looks like and not find out somehow that the whole design has changed. Please bring back the old theme as option! The new version of The Journalist looks really awful. Actually it has very little to do with the old one that I liked and used. If you want to introduce a new theme that’s fine. But why would you want to mess up an existing one that people love and use? Just leave the old theme the way it was, introduce a new one and let people choose. I don’t like that my blog is being messed up by a designer just for the fun of some childish new look. I prefer the previous Journalist theme too. I liked it precisely for its simplicity. Please provide the previous Journalist theme as another option… Thanks! Can we please be given the option of going back? Can both version be offered? Make everyone happy? Thank you. I really think this is unfair. I prefer the old style because it looks more serious. What about some of us who want to keep that previous simple, serious look? Do we just get snubbed? Do you force us to use this against our will? I am going to see if we can keep the old style because simply put it was perfect for what I was trying to accomplish. I am going to take down my blog if this stays as you have ruined the artistic expression I was trying to have. And you did it against my will like some kind of theif in the night. No, more like a barbarian, the way you just clubbed your way in and ransacked everything in crude fashion. The new version doesn’t look as professional or as ‘finished’ as the original. It looks amateurish. The main problem is the font for the content. The change of font really does alter the mood and look of this theme, and very much for the worse, in my view. The font change at least needs to be reversed. I agree that the original should have been retained and a ‘Journalist 2’ theme added instead? And it’s really not on to change the product without the customer agreeing in advance. Sorry WP Team & Lucian Marin, but this time you f***ed up. These are not improvements on an existing theme, this is a new theme. Sure, “The Journalist” was not perfect, but it didn’t need such modifications; infact it now looks totally like something else, beginning with the gone black category bar and going on for.. like every single thing that made me and many other love this theme. Good, but PLEASE fix image centering! I was looking at my blog with disgust today… I really hope there is a way to get the old design back, because I can’t stand the sans serif captions (as well as the light blue boxes below the posts and the “# comments” below the caption). The old design was just perfect. Can I have the old style back? Pretty please? Several people have already said this, but I’d like to add my voice to the clamour – could you re-introduce the old version as well as this, for those of us that preferred it as it was? You could call it ‘Journalist Classic’ or something like that, if you really must. There are aspects of this new one that I like, but on balance I far prefer the previous look of my blog and I faintly resent the fact that the change has been pushed onto me. Ummmm….. look – i am in total awe & appreciation of the WP back-end crew and all the wonderful things they do. i really really dislike these changes. The Journalist absolutely delivered on its promise, but now it sort of looks halfbaked – as if the page hasn’t finished loading. Sorry, but in LOLspeak – do nawt want! pleeeeeeeez take the suggestion of everybody calling for differentiated versions. damn you Heather & Lucian!!!!!. . . . . . . . . . . . see you in H(tm)ELL!!!!!!! Well, I agree with many users, I do not like it : I choose this one because it’s a simple one, sober. No matter with the serif, but I dont’ want to see the line comment/without comment, because most of my posts are not “calling” for answers or comment. PS : Is it going to be translated ? Ready to do it for french language if you need. I like english lang. but I would prefer it in french. Thanks ! it is lovely. lets see how long I will like it ? but we seriously need few more templates. Good ones. yeah…this makeover was badly needed….gud!! Particulary the layou of my pictures. Something is wrong with the new CSS conserning pictures i.e. it won’t accept “no border”! And the text allignment for post with pictures is not always correct. … and picture in the sidebar on the right hand. I now corrected manually the “no float” option in the mentioned post. Again: You should correct the standard CSS in the theme. the journalist theme with a comic bubble? and i don’t like how it says no comments under the headline. What you have done to the Journalist Them ??? It’s much less clean then before ! What is worst You have change also the dimensions, now all my previous post are out of the blog line on the right. I hope you can give me my original blog look back, without resizing all my posts ! Please give us the old design back! 5. What happened to the thick divider between entries! I think the Journalist theme has lost its character, bring the old one back! My blog is completely messed up now. How could we get back to the original theme ? Some good, some not good for a number of reasons, one of which causes me particular concern in the amount of work I will have to do to fix it. And the fact I have just spent an amount of money advertising locally to give a talk on the theme of my blog, the place of nature in the spiritual life, using my blog as the reference point of the advertisements. 1. Comments should come after a post not before. The line should stay but a darker grey. 2. The tagline now showing at top right is good IMO, but as a bubble? A bit cartoonish for me, it looks unprofessional. 3. Written by….. And Posted in….. are in a good spot but put something, a dark grey line and a little space below them to seperate from the next post. 4. The pictures don’t need a blue border, or any border. IMO. Certainly not one that turns red when hovered on. 5. !!! There is now less width across the post page, or more across the side bar. The effect this has on my posts is VERY DESTRUCTIVE. My blog is about the place of nature in the spiritual life and I use pictures to illustrate. Up to ten or twelve thumbnails at times, more often five or six, that I always spend time getting to fit across the top of the post, neatly, professionally. Now, because of less page width, where they were nicely fitted, the right side thumbnail has been bumped down a line throwing all thumbnails for that post out of alignment and making the posts look carelessly composed. This means I will have to check all 100 posts to see which ones need correction and then correct them on Australian DialUp. It will take me weeks at least to edit the affected posts, five in the fifteen checked so far, that’s 33 + posts to edit – on average. This is an urgent concern for me. As I’m sure you can appreciate from the first two sentences of this reply. I know everybody is doing their best. I just don’t have the time to fix/edit so many posts before my ads come out in two days time. Just to check them will take a few days of my free time on dialup. Hope you can fix it sooner than later. At the very least widen the post area to its origional measure now. Please? Ps. I would also like to see GONE those: Possibly related posts (automatically generated) Mostly having no relation to what I do. I like the look , but since it has changed this would make a whole new theme. Like a few others have said if people used the first one and now it has changed it will effect there blog as well. Maybe posting this as Journalist 2 and keeping the first one on there as well might be a solution. Thank You and I will be using this one now that I have found something to fit for me.